If there was any doubt that last week’s Simpsons episode, “No Good Read Goes Unpunished,” was written at least in part as a direct response to/dismissal of Hari Kondabolu’s TruTV doc The Problem With Apu, a quick glance at showrunner Al Jean’s Twitter account should make the cause-effect relationship pretty clear. Jean’s been tweeting about pretty much nothing but Apu Nahasapeemapetilon for the last week, and, specifically, about what a great character he is, and how lucky The Simpsons is to have him—and Hank Azaria’s vocal stylings, cartoon Indian accent and all. 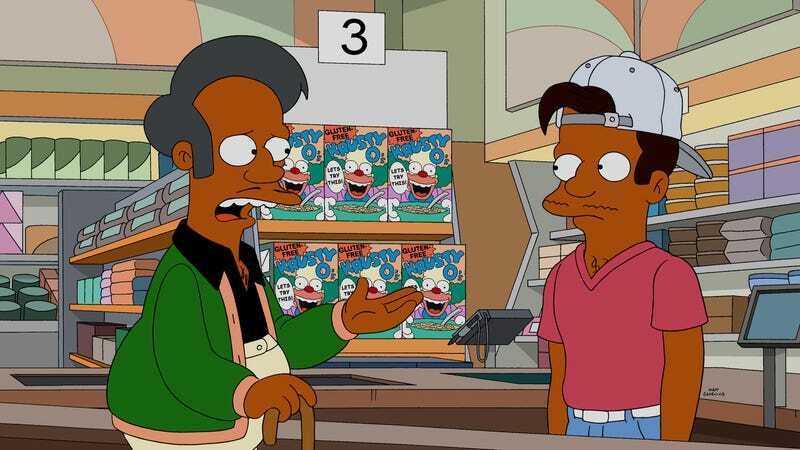 In fact, reading through the various retweets on Jean’s timeline, you’d be surprised to learn that anybody has a problem with this hard-working convenience store employee (who also just happens to a be a collection of Indian-American stereotypes voiced by a white guy), with such Simpsons-friendly publications as The Wall Street Journal, Parlour List, and, uh…The National Review all taking pride of place on the long-time producer’s account. Still, Jean did acknowledge that there’s some kind of issue with the character that requires an eventual solution, even as he makes it clear that it’s probably not going to be one that people upset about the character are actually going to like.